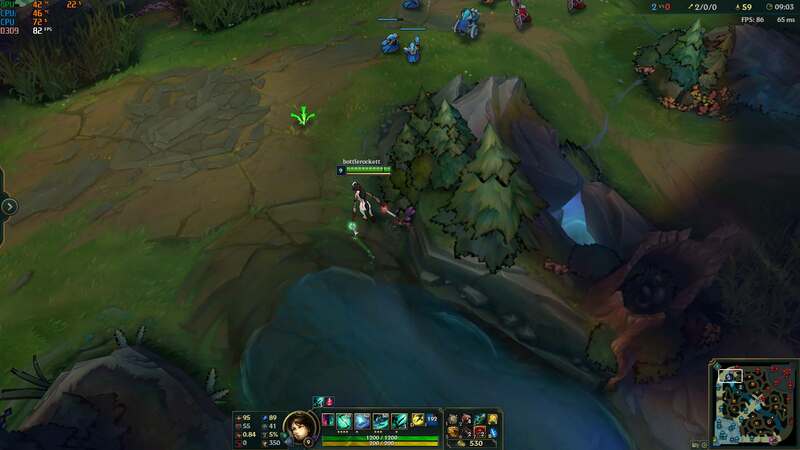 : Akali Shroud VFX Possibly Bugged, Screenshot function broken. in > Akali Shroud VFX Possibly Bugged, Screenshot function broken. If I had to guess, this looks like a debug overlay to test boundaries on shroud. VARUS: Leveling W bugs the sound effect for his auto attack. Are there any plans to do testing on full team voice chat? I don't understand the lack of it. : What I'm saying is that a ton of people seem to be trolling, intentionally feeding, or just straight up AFKing. It's *at least* one person per game. It's incredibly annoying. in > [Slightly off-topic] What's with the amount of toxicity on the PBE? What region are you typically on? I've found that most people from Latin America/EU are extremely toxic in my games. The people flaming me are either speaking spanish or speaking VERY broken english. Can you please just open voice comms to team wide when it releases? Krugs spawning from the biggest Krug go dormant, like I've left the camp, and then despawn quickly. : Hey! You should see a fix for this today :) Thanks for the report!! in > Environment is not rendering correctly when Environment setting is not set higher than "High". No problem, sorry about the typo with the settings. Happy to help! : Next Tuesday, Oct 24, new runes are scheduled to be enabled permanently on PBE. Can you hold on till then? Hey, just to check, did you guys ever nail down that practice tool bugsplat? I was getting access violations at 0000 0000, if that helps. in > Cannot get into game. Are you trying in the practice tool? Think that might be the problem. : Crafting Works but Times out. in > Crafting Works but Times out. I'm sure its just the same thing that occured with the store. People much more interested in opening boxes than actually testing. No, there is only an NA server, and for the forseeable future that is all there will be. The testers are in NA, so there isn't much of a need to expand it globally. There are a couple of posts talking about playing in custom matches with others as a fix for the high ping. : "League of Legnds Client has stopped working"
in > "League of Legnds Client has stopped working"
Already reported. SG Udyr and regular udyr's Q and E crash the game. His Q crashes your team, and his E crashes everyone in the lobby. In the future, search for keywords like "Udyr" and check if theres anything posted. Alot of posts about this already. This has already been reported. Udyr's Q and E both crash the game for everyone. It was the Udyr in your game. His E and Q currently crash everyone to desktop. : There is no elo or matchmaking in pbe. Its not ment to be competitive its ment for testing. You are supposed to be looking at champion interactions, rune interactions on you and others, seeing whats broken and reporting. Don't go into these games expecting to stomp as this is a testing gameplay not to "git gud" And I can give you a tip to help out with not being stomped by junglers. Grab the ghost poro rune and watch your mini map alot more frequently. expect a gank around the 3 min mark early if you are bot or mid lane especially if you have pushed up far. And if you see their jungle top. wait about 30 seconds or so and pop a ward near dragon or above the ledge near their blue spawn if you are bottom. That way you have more of a heads up to get out of there or turn the gank around. in > Cannot find a game with similarly skilled players. I'm jungling, and I am constistently getting stomped. I am not trying to stomp, or even do well, I just want to go even and test. I'm just getting stomped by far higher skilled players. I can't even farm my own jungle for the most part. They see me after invading, go trackers, and 4 buff me. And I'm not good enough to punish. Cannot find a game with similarly skilled players. Does his Q proc it? Since the PBE is primarily intended for english testers, I doubt its of great importance to them to be working on translations in PBE. So you entered draft mode, and 3 people were actually assigned mid? As in 3 summonses had the mid icon next to their name? Yep, same. Live in MA, so quite close to the servers. Even in practice tool I'm getting spikes of 900, and staying around 400.
: Hey is there any way you can tell me were to find the bundles i cant see them anywere on the store? Yeah, sorry about the delay. Here you go; https://imgur.com/a/AFFg5 If the bundles aren't there, they might be disabled. I got them a little bit earlier today. FYI; don't buy individual champions. There are four bundles that contain all the champions for ~30RP a piece. : Same. My account is also still level 1 even after receiving my RP and BE. The PBE did just get a big influx of players; my uneducated guess is that is part of the problem. Same here. Can't buy bundles, can't buy skins, etc. Got my BE/IP, didn't get level 30.